Pucallpa, whose name means “red land” in Quechua, is the capital de Ucayali and one de the most progressive cities in the Peruvian Amazon rainforest whose inhabitants make a living from logging and agriculture. The Panos people initially inhabited the department. 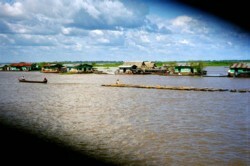 The Ucayali River is one de the most important highways in the central jungle. Lake Yarinacocha, one de the largest in the Amazon rainforest, is just a few minutes away from Pucallpa, and the Shipibo-Conibo people have settled along its shores. The place is perfect for rest and relaxation in the many tourist lodges and for enjoying water sports such as water skiing, rowing and fishing. The area is also inhabited by the descendents de the Panos, people full of hospitality and skillful artisans who sell their works. Also located in the department is the Padre Abad Boqueron Water Channel, a narrow canyon with several waterfalls with curios names like Velo de la Novia (Bride’s Veil) and the Ducha del Diablo (Devil’s Shower).